First Line: The strange woman standing on Hope's main street was so ordinary it was almost scandalous. For over two years Sara, a former bookstore employee from Sweden, has been corresponding with the elderly Amy, but when Sara arrives in Broken Wheel, Iowa for the vacation the two of them have planned, she learns that she just missed Amy's funeral. Broken Wheel is a dying town, and its residents are more than happy to take care of the bewildered Sara-- that is until she completely confuses them by saying thank you for their kindness by opening a bookstore on Main Street. None of Broken Wheel's residents are readers, but little do they know just what an impact Sara's quirky little bookstore is going to have on their lives. 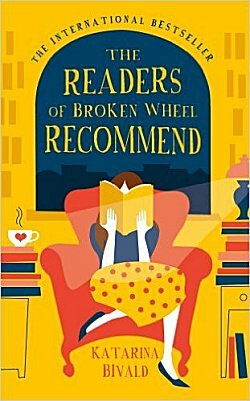 Still smiling from reading Fredrik Backman's A Man Called Ove, I bought fellow Swede Katarina Bivald's The Readers of Broken Wheel Recommend. Although I don't necessarily need to be reminded of the importance of books and the connections they can make in my life and the lives of others, I'm not about to turn down the opportunity to read about it. At first, I was charmed by the awkward Sara Lindqvist and the residents of Broken Wheel who come to her aid. I could even picture the dying little town in my mind's eye. (I've seen enough of them, unfortunately.) Sara is persuaded to stay for the length of time she'd originally intended, and when townspeople are so friendly and helpful, she knows she has to pay them back in some way. Since books have always played a large part in her own life, Sara feels that the best way to say thank you is to use Amy's books to open a bookstore in one of the vacant storefronts on Broken Wheel's tiny Main Street. I have to admit that the book was bubbling right along at this point; I was smiling and enjoying the story. The highlight is when the townspeople decide to make Sara's bookstore a success-- and how they plan to go about it. Bivald uses humor to good effect several times throughout the book and especially during this portion. However... once that plan for bookstore success is carried out, it seems that there's nothing left in Broken Wheel to do but mend personal relationships, and for me, this is when the fizz leaves the champagne and the book becomes a bit of a bore. Until then this book had a magical sort of fairy tale quality about it that made it a joy to read, and it had everything to do with Sara, her books, and the special little bookstore that she created. If you don't mind your fairy tales being told with chapters of self-help romantic advice, The Readers of Broken Wheel Recommend will certainly be your cup of tea. Regretfully I had to leave my cup half full. Translated from the Swedish by Alice Menzies. Oh, I'm sorry that the fizz went out of this book for you, Cathy. I'd heard some good things about it, but honestly, that sort of 'fix all the relationships' isn't my thing, either, as a rule. Still, I'm glad you found some things to like. Oh, there are several things to like, Margot, and only one thing to dislike.